In recent years, there have also been a number of new strategies for implementing community land trusts andcooperative housing. Since land values typically account for 25% to 75% of house prices, a community land trust (CLT) can serve to remove land from the market and thus drastically reduce housing prices and keep homes permanently affordable. There are now over 250 CLTs in the USA and about 50 established with more than 100 in the pipeline in the UK. The model is being developed in Canada and in Belgium, and interest is gaining in France and Portugal. CLTs are attractive because they are flexible models for a wide variety of urban commons development – not just housing but workspace development, community-owned energy generation, and new forms of urban agriculture and community gardens. There are also some interesting legal innovations in the internal governance structures for co-operatives. The Sustainable Economies Law Center is currently developing an impressive set of new legal provisions for governance of co-operatives to assure a “true sharing economy.” Among the goals: genuine sharing of the wealth by co-operatives with local communities; safeguard against market buy-outs such as the one orchestrated by Couchsurfing; assure fair and balanced wages and avoid large wage disparities within the co-op; shared capitalization to prevent disproportionate losses or harm to any single stakeholder; highly participatory governance structures instead of concentrated power based on capital ownership; and greater sharing of resources (food seeds, water, energy) rather than artificially limiting access; and prioritization of advancing the common good. Along these same lines, one can point to the ingenious legal scheme developed by a housing co-op, Mietshäuser Syndikat, in Germany, to assure that residents enjoy the right of self-management of their building while making any sell-off of the building in the future difficult. How? The building is jointly owned by the not-for-profit residents’ association of 300 members and by a limited liability corporation, each of which has one vote. Any fundamental changes require a “yes” vote by both partners, essentially giving each veto power. The associated corporation can act as a check upon a potential stampede by co-op members to sell the building. Following a 2014 conference of garden cities in the UK, there has been renewed interest in the model of citywide mutualization of infrastructure, a model pioneered by the Letchworth Garden City. This city was built in 1903 on 5,000 acres of co-operatively owned land north of London; all utilities were municipally owned until 1945. The income and the economic rents paid by the businesses in the town made Letchworth economically resilient. Another new co-op based model now being explored is open co-operativism, which consists of using familiar co-operative structures on open network platformsto carry out crowdfunding, crowdsourcing of knowledge and governance through online platforms. This idea was given focus at a gathering in Berlin in August 2014 that tried to “imagine a new sort of synthesis or synergy between the emerging peer production and commons movement on the one hand, and growing, innovative elements of the co-operative and solidarity economy movements on the other.” (For more, see footnote #42.) The Enspiral open value network mentioned above might be considered an open co-operative; so might the FairCoop and multistakeholder co-operative models cited above. The point is to try to use the distinct capacities of open platforms – for self-selected participation, iterative innovation, knowledge-sharing and high-quality, low-cost self-provisioning – to avoid conventional market providers and become more self-directed. To promote this new model by providing financial administrative and political support, UK academic and co-operative advocate Henry Tam has proposed the establishment of an Open Cooperative Development Agency. Besides propagating new co-ops, the goal would be to promote an “open ethical economy” through which co-operative entrepreneurs could co-produce commons through coalitions of ethical entrepreneurs and a market sector comprised of collectively oriented enterprises. This topic is gained more relevance now that some venture capitalists are realizing that respect for online user communities – including meaningful voice and governance – may be the key to the success of investor-owned social media platforms. Another new type of co-operative venture – which draws inspiration from the licenses created to protect open source software -- are seed sharing licenses to protect and promote the co-operative use of shared seeds. Sociologist Jack Kloppenberg at the University of Wisconsin has started the Open Source Seed Initiative to provide legally protection for non-proprietary seeds, making sure that the genes in at least some seeds will not be locked up by patents. Launched in April 2014, the project asks breeders and stewards of crop varieties to sign to a pledge to make their seeds available without restrictions on use, and to ask recipients of those seeds to make the same commitment. In 2015, there was a big surge of interest in urban commons, many of which rely upon new legal frameworks or specific municipal ordinances. One of the most significant such experiments in urban commons is the Bologna Regulation for the Care and Regeneration of Urban Commons. This one-year old project in Bologna, Italy, is attempting to remake local government and transform standard bureaucratic process by inviting ordinary citizens and neighborhoods to come up with their own urban commons ideas, and then work with the government to make them real. The city now has more than 90 “pacts of cooperation” with self-nominated citizen groups, each of which works with the city in three areas – “living together, growing together and making together.” Examples include a neighborhood becoming a designated steward of certain public spaces or gardens; residents of a street removing graffiti with the city’s help; parents who are managing a local kindergarten; and neighbors creating “social streets” that encourage socializing. Originally developed by the Laboratory for the Governance of Commons (LabGov; Professor Christian Iaione) and by Labsus (Laboratory for Subsidiarity; Professor Gregorio Arena), the Bologna Regulation is now being emulated by dozens of Italian cities. A broader, US-based initiative is seeking to promote “shareable cities.” Two Bay Area organizations – Shareable and the Sustainable Economies Law Center -- released an October 2013 report, “Policies for Shareable Cities: A Sharing Economy Policy Primer for Urban Leaders.” Ther report identifies “scores of innovative, high impact policies that US city governments have put in place to help citizens share resources, co-produce and creative their own jobs.” Examples include carsharing, bikesharing and ridesharing, as well as changes in local taxes and other policies to promote them. Other “sharing policies” encourage urban agriculture on vacant lots, easier permitting to encourage home-based micro-enterprises, and city permission for the selling of homegrown vegetables in the neighborhood. A “sharing city” can also include city-supported co-working spaces, shared commercial kitchens, community-financed startups, and spaces for “pop-up” businesses. A number of cities have very aggressive sharing cities initiatives, including Seoul, Korea; Lille, France; and Barcelona, Spain. The field of urban commons is still nascent but rapidly growing, so it’s difficult to predict how it will evolve. Among the upcoming developments: a major conference on urban commons in Bologna, Italy in November 2015, co-hosted by LabGov and the International Association for the Study of the Commons; a strategy workshops and book anthology on the topic being organized by Shareable; and burgeoning interest in open data and cities (see “Ubiquitous Commons” above in section 3). One notable socio-legal-ecological experiment for urban living is the Charter of the Eco-Quartier of Lausanne (Switzerland), a site of 30 hectares in the city, Plaines-du-Loup, that will be built in 2017 and ultimately have about 3,500 homes and more than 10,000 residents. This section of the city aims to create and implement new models of property and social norms that will facilitate more ecological forms of urban life. The neighborhood is envisioned as a living, self-governing community of commoners that will “negotiate” with the city government and undertake systemic social and design approaches to buildings, transportation, energy, waste and social activities. Apartments, for example, will be designed to accommodate adaptive changes during the life cycle of the inhabitants, such as adding rooms to accommodate new children and removing rooms as children leave home. Participatory budgeting, a process pioneered in Porto Alegre Brazil in 1969, is continuing to gain in popularity, particularly in the US. This procedure invites city residents to democratically determine how a (modest) portion of their city’s budget is allocated. Since coming to the US in 2009, participatory budgeting has been used in Chicago, San Francisco, St. Louis, Boston, Vallejo, much of it promoted by the Brooklyn-based Participatory Budgeting organization. Worldwide, there are now more than 1,500 participatory budgeting projects being carried out. A number of cities have pioneered new sorts of digital initiatives to improve cities (beyond the open data efforts mentioned above). One of the more significant is the pioneering work of Linz, Austria, which launched the Open Commons Linz initiative to foster open information and digital access in many guises: free email and wifi for residents, public space server, use of open data, use of Creative Commons licenses, access to government information, geodata based complaint management, and more. In a related vein, some cities recognize that government procurement policies could be an especially powerful force. The Evergreen Cooperatives of Cleveland, Ohio, are a pioneering example of leveraging the power of public monies to create green jobs at a living wage, and to boost local economies. In the digital context, government procurement can also be used to advance open technical standards, open source software, worker co-ops, open data, open educational resources, and the use of Creative Commons-licensed works. The Sustainable Economies Law Center has gone further, suggesting that perhaps city governments should develop open platforms for taxis, short-term housing and other resources as “municipal software cooperatives.” This idea of an “open information commons” for cities has great potential in other cities, but it requires new legal authorizations and programs. Newly available Top Level Domains (Web URLs) for major cities could be an unprecedented tool for urban planning and livelier cities. Ever since ICANN, the Internet domain-name body, authorized cities to apply for their own Top Level Domains (e.g., .nyc, .paris, .berlin), major cities have had the opportunity to use electronic networks as part of their urban planning – something that has become highly appealing as smartphones become ubiquitous. The TLDs provide a way for people to have easy access to city resources via the Web. For example, New York City could in principle put all museums under the domain name www.museums.nyc, and a neighborhood could have its own domain name (www.jacksonheights.nyc). However, many cities appear more inclined to auction off the TLDs rather than use them as urban planning tools to make the city more lively and easier to navigate: another political contestation over digital space. Timebanks and alternative regional currencies are another innovation that have great potential to help revive the social and economic fortunes of cities. The Helsinki Timebank, for example, is a robust barter-credit system that helps people without much money both provide and receive everyday services that might not be able to afford: dog-walking, lawn-moving, care-taking, rides to doctors, and so. In other cities, local currencies are attempting to relocalize economic activity, such as the successful effort of the Bangla-Pesa – in effect a currency, but officially “a credit-clearing system for multilateral reciprocal exchange” – that enables hundreds of poor residents in a poor neighborhood in Mombasa, Kenya, to meet their basic needs. But in the face of state fears about Bitcoin and other self-organized currencies, the legal complications in using and expanding such currencies are increasing. There are also sometimes tax and legal complications in using such currencies, and resistance by city governments to payment of taxes with them. The Convention on the Use of Space is a legal instrument developed by Adelita Husni-Bey to support the use value of housing and occupied space over vacancy and speculation. The document was written through a collaboration of lawyers, activists, squatters, researchers and cultural workers. Although not currently recognized by the legal system in the Netherlands (where it was first released) or by other national or municipal authorities, the Convention is intended to bring attention to the problem of unused spaces and financial speculation. It also gives squatters and other occupiers of vacant property a serious legal tool to assist them in their campaigns to re-appropriate property for the common good when it is not being used. Community ordinances. This project run by CELDF, the Community Environmental Legal Defense Fund, in the US, seeks to empower local communities to resist fracking, the transport of hazardous materials, and other violations of local self-determination, especially on environmental matters. The legality of such ordinances under state and federal law may be problematic, but in some ways that is the point – to dramatize how outsider investors, in collusion with state and federal governments, are riding roughshod over community sentiment, and to provoke test cases and political controversy about enclosures of local commons. The community charters movement. In a number of countries, people are drafting their own community charters to assert moral and legal right to control certain local resources. Inspired in part by CELDF’s “Community Bill of Rights,” community charters have been drafted to protect a wide variety of resources at different scales: neighborhoods in Dakar, Senegal; the entire city of Bologna, Italy (see section #6); the venerated Teatro Valle in Rome which the city government tried to sell to private investors; and the Great Lakes Commons Declaration. There is a Felkirk City Charter in the UK, and a charter developed by the self-managed cultural space, the Aqua Bene Comune, in Milan. Remix The Commons has recently begun a project to compile a compendium of community charters and mapping tool – an “Atlas of the Charters of Urban Commons” – in concert with actors directly involved in the field, using collaborative and participatory methodologies. The goal is to promote more community charters through a process that Remix describes as “exploratory, pragmatic, pedagogical and political” as well “interdisciplinary and inter-cultural.” The Remix database will include the players in each charter, the purpose of sharing, the goods and means being used, the fundamental rights asserted, the mechanisms for meeting user rights, etc., as well as the types of shareholder organizations. The “Assets of Community Value” law is a tool by which a local community in England can assert a legal interest in a pub, public library, community center, sports team or other resource that citizens regard as an “asset of community value.” Use of the law can give buildings, land and enterprises a degree of legal protection from development or relocation, and enable citizens to try to buy them. It can be quite difficult for the community to raise necessary funds, but the law has nonetheless resulted in more than 100 beloved pubs being declared assets of community value and many other facilities have been saved. There are other interesting initiatives to empower neighborhoods, including David Sloan Wilson’s The Neighborhood Project, which is attempting to apply evolutionary science and complexity theory principles to the challenge of stimulating neighborhood change. Relocalization of production and governance is a key theme for such efforts as the Transition Town movement, Slow Food, Community Supported Agriculture, and the climate-change movement, among others. There is a great deal of experimentation going on with new organizational forms because old structures, whether for-profit or nonprofit, do not adequately recognize and support the types of commoning that people are doing or aspire to do. The old organizational structures, even in their variations (co-operatives, limited partnerships, charities, nonprofits) often reflect institutional orientations to markets and the economics of scarcity. How, then, to devise organizational forms that can both serve the interests of commons while being legally recognized by the state? Perhaps the most salient American experiment in this regard is the benefit corporation, or B corporation, which has been approved by 28 states as of October 2014. These state laws explicitly expand the definition of the fiduciary duty for corporate boards of directors, allowing enterprises to take non-financial interests – i.e., the public good, ecological concerns – into explicit account in their investment and management decisions. However, it is unclear how significant benefit corporations will be in actually fostering socially minded change, given the hierarchical, market-oriented and legalistic structures that remain, or indeed, whether the validity of B corporations will be challenged in court. One of the more interesting new organizational forms is the “omni-commons,” which are enterprises that take on administrative, fiscal and legal tasks for collectives of small, artisanal enterprises with a commons orientation. The Omni Commons of Oakland, California, is one notable example. It is a large “collective space to share and commune” comprised of several Bay Area collectives that has a shared political vision of “equitable commoning of resources and meeting of human needs over private interests or corporate profit.” In its large building, it hosts the Contemporary Art Museum of Oakland, a citizen-science and DIY bio space for open sourcing biology, a small book publisher, a food justice advocacy and support group, a radical film and video collective, a hackerspace, a worker-owned café, and a print shop. There are other fascinating omni-commons elsewhere in the world, such as Cooperativa Integrale Cataluna (CIC) – mentioned earlier – which sees itself as a strategic intermediary for commoners in dealing with state taxes and regulations and with complex legal and bureaucratic issues. CIC also provides financial support to such enterprises.. Some CIC members and other partners are now launching FairCoop and FairCoin in an audacious attempt to invent a new global financial system (see section #3). Another impressive omni-commons is Cecosesola in the Venezuelan state of Lara. Cecosesola is a network of about sixty cooperatives and grassroots organizations, with about 20,000 members. It provides healthcare to 200,000 patients every year, funeral services, produce selling in local markets, and a variety of co-ops that are run on the basis of consensus, trust and egalitarian principles. It may be premature to declare the Fresno Commons an omni-commons, but this fledgling enterprise – legally a trust – certainly seems headed in that direction. This organization is attempting to integrate the major components of the food production system in the Fresno, California, region, so that the “surplus value” produced by member-organizations can be mutualized. This will allow it to lower costs; meet the needs of more poor people; improve working conditions and pay for agricultural workers; and adopt safer, more ecological agricultural practices. In New England, 50x60, a consortium of New England local agriculture groups is attempting to develop a new organizational form for regional agriculture, distribution and retailing that can federate local agriculture in five or six states. (“50x60” refers to the ambition of producing 50% of all food locally by 2060.) It is clear that the legal, administrative and financial challenges of omni-commons deserve much greater exploration. Digital platforms are also incubating some innovative new organizational forms. One of the most intriguing is the Open Value Network, which have been described as an “operating system for a new kind of organization” and a “pilot project for the new economy.” OVNs consist of digital platforms that facilitate new modes of open, decentralized and self-organized social governance, production and livelihoods. Two of the leading OVN projects, Sensorica and Enspiral, are organized in ways that let anyone to contribute to the project, and be rewarded based on their contributions, as measured by actual contributions, experience and other collectively determined criteria. Unlike “conventional commons” that tend to eschew market-based activity, open value networks have no reservations about engaging with markets; OVNs simply wish to maintain their organizational and cultural integrity as commons-based peer producers. This means open, horizontal and large-scale cooperation and coordination; responsible stewardship of the shared wealth and assets while allowing individual access, use, authorship and ownership of resources “where appropriate”; careful accounting of individual “inputs and outcomes” via a common ledger system; and the distribution of fair rewards based on individual contributions to the project. Some notable keywords for describing OVNs: equipotentiality, anti-credentialism, self-selection, communal validation and holoptism. OVN stress that while they may be legally nonprofits or for-profits, they are not functionally either in that they have no retained earnings or fixed assets. They instead function as “a flow-through entity which is as formless as possible,” but which functions as a trust for members, as outlined by a “nondominium” agreement. While still fairly rudimentary, OVNs represent a new type of consensual governance/production regime, bound by contractual terms, that blends commons principles and market activity. Other OVNs include the projects iAGRI innovation portfolio, Greener Acres, metamaps and Guerrilla Translation. Some digital communities with open-source commitments are developing digital constitutions as ways to govern their network-based community. In obvious ways these “constitutions” are not binding in the way that conventional constitutional law is. 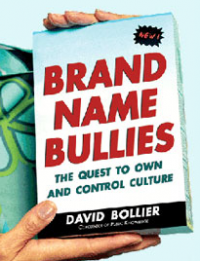 Yet they are serious attempts to give definition to the social and political structures that govern a networked community; the documents provide a moral basis for social sanctioning of violators – and in some cases, provide resort to conventional courts for enforcement. For example, the open design and production community Wikihouse has developed a constitution outlining how it functions as an open community. Officially a British nonprofit, Wikihouse invites users to submit design work and collaborate with others, and officially renounces intellectual property rights in the designs on its website (while disclaiming any legal responsibility for the uses of designs). However, Wikihouse does license its trademark to chapters that it approves, official partners, certified designers and manufacturers. Similarly, open source Linux groups like Debian (a community that produces a “Debian distribution” of GNU Linux) have a constitution. One tool to make a digital constitution more enforceable is to embed it in the Terms of Service, thereby making it part of an enforceable contract if users opt in to the website. For more, see the Terms of Service contract for peer production mentioned in section #3 in yesterday's post. The deficiencies of the nation-state as a form of governance are becoming increasingly clear, and often resented, largely because nation-states tend to be tightly aligned with large corporations and neoliberal economic policies, and thus hostile to initiatives to protect ecosystems, human rights and commons from market enclosure. In addition, beyond any matters of politics or ideology, the centralized bureaucratic state seeking to assert comprehensive territorial control is increasingly incompetent. Decentralized networks are proving to be faster, more innovative and more responsive to local circumstances than the conventional state apparatus. This mismatch between archaic forms of national and international law on the one hand, and the unmet needs of people and ecological stewardship on the other, is causing new tensions – as well as new proposals seeking to re-imagine state policy and commoning. I will review some of the more prominent proposals, which range from the conceptually familiar to the daring, experimental and paradigm-shifting. The most prosaic reform efforts are surely the “Gov 2.0” initiatives that are attempting to remake conventional bureaucracy. The basic goal is to engraft network functions on to existing government bodies through such add-ons as crowdsourcing, social media and citizen-science. For example, city government are implementing “smart cities” digital systems to improve traffic control, parking, street lighting and energy management. Regulatory agencies are open to citizen-science projects that submit ecological data and species sightings. The US Patent and Trademark Office’s “Peer to Patent” website invites crowdsourcing of “prior art” (existing inventions that may invalidate a patent application). A fascinating tech-based proposal seeks to leverage the power of open networks to erect a new legal architecture for government regulation. The idea, offered by tech entrepreneur John Clippinger, is to use open APIs as a portal for real-time, automatic reporting by regulated entities. Much as Apple has open APIs (application programming interfaces) for app developers for the iPhone, government could provide an open API through which all regulated parties (e.g., financial services, polluters) could devise appropriate apps that would submit real-time data as they pertain to regulatory compliance. This could bypass the many cumbersome bureaucratic steps of conventional regulation and enable broader discretion for how enterprises meet performance standards (without the abuses that tend to come with regulatory flexibility). In Madrid, there is an effort underway by Medialab-Prado to facilitate access to public databases by creating an API that would let them use the data for their own purposes, including self-management of their enterprises or civic projects. 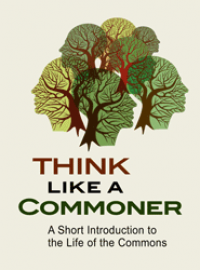 A more serious attempt to remake conventional government by introducing the commons paradigm can be seen in the newly formed task force of the European Parliament known as the European Parliamentary Intergroup on Common Goods and Public Services. It is one of 28 Intergroups established by the Parliament that has no official decisionmaking powers but that often affect law and regualtions, and stimulate important political and policy debates. The group conjoins “common assets” with traditional public services, without really calling attention to how the commons entails a different logic and set of social practices and relationships than those of the modern liberal state. Still, the task force may be a useful forum for focusing the actual philosophical and operational differences between a liberal state and commons. Another attempt to use existing legal venues to protect the commons involves broader applications of the public trust doctrine, pursued through litigation. The public trust doctrine is an ancient legal principle that affirmatively requires the sovereign or governments to protect resources that belong to the unorganized public and to future generations. Historically, courts have applied this legal principle mostly to coastal areas, rivers, lakes and other bodies of water, with modest extensions for other elements of nature. However, in 2013, law professor Christina Wood of the University of Oregon helped develop an ambitious set of lawsuits, the Atmospheric Trust Litigation, to attempt to get US courts to force governments to implement enforceable science-based Climate Recovery Plans, under the authority of the public trust doctrine. On behalf of children associated with an advocacy group, Our Children’s Trust, lawsuits were filed in all fifty states and in federal court. While the U.S. Supreme declined in October 2014 to rule on the lawsuit, five state lawsuits are now pending – in Oregon, Massachusetts, Colorado, Washington and North Carolina. Litigation efforts are also being pursued in nine nations around the world. Can the public trust doctrine reinvigorate state trusteeship of common assets on a global scale? New Zealand law professor Klaus Bosselmann explores this theme in a forthcoming book, Earth Governance: Trusteeship of the Global Commons, which proposes a new international regime in which states are now “owners” of natural resources but trustees of Earth as an integrated whole. Innovative international legal efforts to protect the atmosphere as a commons are also underway. One such lawsuit consisted of 886 Dutch citizens and the Dutch NGO Urgenda suing the Dutch state for neglecting its duty of care towards the citizenry and future generations by not reducing CO2 emissions quickly enough to avoid catastrophic climate change. As one plaintiff wrote, “We asked the judge to order the Dutch State to reduce its CO2 emissions with 25-40% in 2020, the percentage that science and international agreements tell us is needed if we want to stay below the 2 degrees threshold.” The court relied on Dutch tort law; European human rights standards such as article 2 and 8 of the European Convention of Human Rights; the precautionary principle; the UN Framework Convention on Climate Change; among other legal provisions. In June 2015, a Dutch court ruled in favor the plaintiffs. Given the reluctance of courts to be instigators of dramatic political or social change – however warranted by legal doctrines and case history – the Dutch ruling may end up as an aberration, with courts shifting the burden to legislatures and elected officials to take action. Another ingenious legal strategy used by commoners has been the development of a new legal doctrine guaranteeing access to commons goods as a fundamental human right. This idea had its origins with Professor Stefano Rodotà of Rome, a prominent legal scholar and politician. The government-sanctioned Rodotà Commission in 2007 produced the first legal definition of the commons as assets to be managed in the interest of future generations. Commons were defined as “goods that provide utilities essential to the satisfaction of fundamental rights of the person,” and access to such goods would be guaranteed no matter if the formal title of ownership were public or private; in all cases the asset must be protected in the “interest of future generations.” This initiative did not succeed, but it did inspire a cultural movement to defend commons as a fundamental right, most conspicuously in a successful campaign against the privatization of Italian water systems and in a three-year occupation of the Teatro Valle in Rome when the city government threatened to sell it to investors (see section #7 above). Another important attempt to link commons and human rights, and to advance fuller dimensions of both, is a Universal Covenant Affirming a Human Right to Commons- and Rights-Based Governance of Earth’s Natural Wealth and Resources, as outlined in by international human rights scholar Burns H. Weston and commons activist David Bollier in their 2013 book, Green Governance: Ecological Survival, Human Rights and the Law of the Commons. The Universal Covenant is a declaration for citizens, organizations and governments to affirm. It encapsulates many of the themes of Green Governance in calling for a legal framework for commons-based governance of large-scale common pool resources such as the atmosphere. A similar effort to establish a new kind of “people’s law” – separate from the legality of the state, and asserting greater legitimacy – is the Permanent People’s Tribunal Session on the Human Rights Impacts of Fracking.Based in Rome, the Permanent Peoples’ Tribunal is an internationally recognized public opinion tribunal functioning independently of state authorities that applies human rights law and policy to cases brought before it. The Tribunal had its origins with the Bertrand Russell-Jean Paul Sartre Vietnam War Crimes Tribunal in 1967, and hears cases in which prima facie evidence suggests abridgement of basic rights of ordinary people. As the above examples suggest, many activists and legal scholars are interested in expanding existing bodies of law to take cognizance of the commons. One focused effort in this regard was a one-day conference held in Paris in April 2015 on “European juridical strategies for the commons.” It was attended by an illustrious group of legal scholars, activists, NGOs and others, to explore practical ways to move this agenda forward. One strain of legal innovation has been to give legal recognition to Nature itself, or “Nature’s rights” – an idea that Ecuador and Bolivia have recognized in their constitutions, inspired in part by indigenous peoples in those nations. The idea of “Pachamama” or “Earth Jurisprudence” has spread beyond those nations, and Evo Morales, President of Bolivia, has urged the UN to recognize the “Inherent Rights of Mother Earth” – and to move away from the anthropocentric rights paradigm of environmental protection. While these legal ideas may or may not become incorporated into conventional jurisprudence, they are having an effect on people’s thinking and behavior. In New Zealand, after many clashes between Maori and the state over ecological governance, “some non-Maori New Zealanders now speak of themselves as kai-tiaki or guardians for rivers, beaches and endangered species.” In a few cases, such as a settlement with an indigenous Whanganui iwi (kin group), the Crown recognized the group’s iconic river as a legal being. These ideas are not being driven by law or politics alone, but by a deeper recognition (which manifests in politics and law) that the prevailing “cosmo-logic” of western capitalism, which clings to dichotomies of subject and object, mind and matter, culture and nature, is falling apart as the relational thinking inherent to commons comes to the fore. Michel Bauwens of the P2P Foundation has been advancing the idea of the state acting as a “Partner State” in support of commons and peer production. (A prime example is the Bologna Regulation described in section #6). 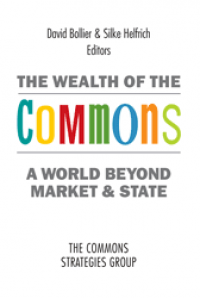 In a world with a flourishing commons sector, the role of the state changes. As Bauwens puts it, “One the one hand, market competition will be balanced by cooperation, the invisible hand will be combined with a visible handshake. On the other hand, the state is no longer the sovereignty authority. It becomes just one participant among other sin the pluralistic guidance systems and contributes its own distinctive resources to the negotiation process….official apparatuses remain at best first among equals. The state’s involvement would become less hierarchical, less centralized and less directive in character. The exchange of information and moral suasion become key sources of legitimation and the state’s influence depends as much on its role as a prime source and mediator of collective intelligence as on its command over economic resources or legitimate coercion.” The idea of the partner state is intriguing, but will require further theoretical elaboration and investigations in how it might be politically actualized. Michel Bauwens on the Rise of Multistakeholder Cooperatives,” Shareable magazine, November 5, 2014, at http://www.shareable.net/blog/michel-bauwens-on-the-rise-of-multi-stakeh... See also Margaret Lund, “Solidarity as a Business Model: A Multistakeholders Cooperative Manual,” (Kent State: Cooperative Development Center, 2011), at http://community-wealth.org/content/solidarity-business-model-multi-stak... and a listing of articles and reports about multistakeholder coops, at http://library.uniteddiversity.coop/Cooperatives/Multi-Stakeholder_Co-ops. 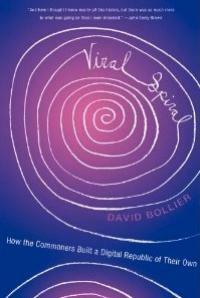 This account comes from Pat Conaty and David Bollier, “Toward an Open Co-operativism: A New Social Economy Based on Open Platforms, Co-operative Models and the Commons,” Commons Strategies Group, January 2015, available at http://www.boell.de/en/2015/01/21/toward-open-co-operativism. For an overview, see David Bollier’s blog post, June 4, 2015, at http://bollier.org/blog/bologna-laboratory-urban-commoning. LabGov’s webpage: http://www.labgov.it/bologna-regulation-on-public-collaboration-for-urba... For the Regulation itself, see http://www.comune.bologna.it/media/files/bolognaregulation.pdf. http://www.ecoquartier.ch/sites/default/files/Publication%20AE%202015%20La%20charte%20de%20 quartier_brochure.pdf. See also http://www.ecoquartier.ch/publications and http://www.lausanne.ch/en/ lausanne-en-bref/lausanne-demain/projet-metamorphose/sites/les-plaines-du-loup.html. http://www.cecosesola.org. See also, “We Are One Big Conversation”: Commoning in Venezuela,” in Bollier and Helfrich, Patterns of Commoning (Amherst, MA: Off the Common Books, 2015). 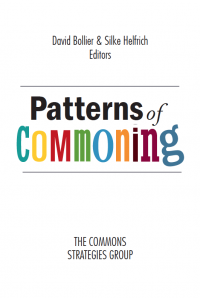 For more on the EU Intergroup, see this blog post by German Sophie Bloemen of the Commons Network, http://www.euroalter.com/2015/what-we-share-a-commons-intergroup-takes-o..., and this blog post by Brit Dennis Postle, https://psycommons.wordpress.com. Mary Christina Wood, Nature’s Trust (Cambridge University Press, 2014). Bollier and Weston, in collaboration with law scholar Anna Grear, Editor of the Journal of Human Rights and the Environment, will host a spring 2016 workshop that will seek to move this idea forward. Independently, Bollier is now preparing an essay exploring the role of new tech platforms in facilitating commons-based governance at larger scales. Participants included the International University College and its Institute for the Study of Political Economy and Law, the Municipality of Naples, and the Institut international D’etudes et recherches sur les biens communs. For the charter itself, see http://www.commonssense.it/emend/european-charter-of-the-commons-eng, For more on the effort, see http://www.commonssense.it/s1/?page_id=800#sthash.idsp1sRR.dpuf; http://www.euroalter.com/2013/towards-a-european-charter-of-the-commons; and http://www.commonssense.it/emend/european-charter-of-the-commons-eng. 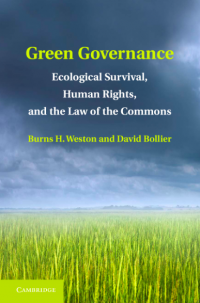 See Burns H. Weston and David Bollier, Green Governance: Ecological Survival, Human Rights and the Law of the Commons (Cambridge, University Press, 2013), especially Chapter 3, “The Quest for a New Rights-Based Pathway,” pp. 50-76. Anne Salmond, “The Fountain of Fish: Ontological Collisions at Sea,” in Bollier & Helfrich, Patterns of Commoning (Amherst, MA: Off the Common Books, 2015). A forthcoming book may take this a step further: Ugo Mattei and Fritof Capra will publish The Ecology of Law: Toward a Legal System in Tune with Nature and Community (Berrett-Koehler), in fall 2015.